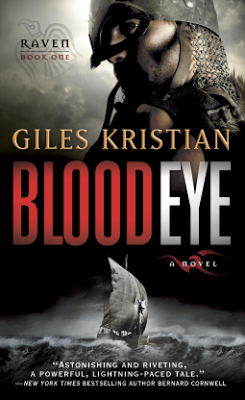 At the dawn of an age of Scandinavian raiding throughout Western Europe, a young man rediscovers a forgotten heritage that links him to a proud band of Norse warriors in Blood Eye, the first of Giles Kristian’s Raven trilogy. Swept up in their quest to find honor and glory in battle, Raven tests the limits of his endurance and finds companionship among these resilient but brutal warriors. Raven does not know the name his parents might have given him at birth, where he was born or whether he has any living relations. His entire existence revolves around life in the Wessex settlement of Abbottsend, where he serves the old, mute carpenter Ealhstan and finds himself shunned by others who are suspicious of his blood-red eye. While fishing for his master’s breakfast at dawn, two boats come ashore. The crew wields swords, axes and shields. Their words, suddenly easily understood by Raven, promise trade, but the menace surrounding Jarl Sigurd’s men belies the promise of an easy exchange. Just when it seems the visitors will take their riches and go, treachery brings about a violent end to village life. Raven and Ealhstan become captives of the bloodthirsty crew. Every event that unfolds in this tale is unexpected, from Jarl Sigurd’s arrival and departure from Abbottsend to his tenuous truce with an English lord whose village he almost destroys. Even the bond Raven forges with the men who have taken him from the only life he remembers is as unpredictable as his ability to survive and forge a new identity among them as an equal. There is no assurance of survival for anyone. Would-be enemies can easily change allegiances, while many a man cannot depend on the loyalty of his own compatriots. Blood Eye is a rich story of adventure told in the style of the Norse sagas, revealing much about the harshness of life in the Scandinavian sailing age and the surprising fellowships forged between people.